McDonagh was referring to Mildred Hayes, the character at the center of McDonagh’s latest dark, disheartening and altogether dynamic flick “Three Billboards Outside Ebbing, Missouri.” Hayes is played with jaw-dropping supremacy by the always impressive Frances McDormand. On a quiet, foggy drive down Drinkwater Road, the fragmented remnants of a set of billboards gives Mildred (McDormand) pause – and clearly an idea, as she puts her car in reverse to stoically stare at the trio in progression. Make no mistake; those “certain people” are specific. And her strategy involves 20-foot tall reminders to them in big, bold lettering. Seven months after the murder of Mildred’s daughter Angela, there still have been no arrests. So, these pointed and inquisitive – not “defamatory,” mind you – billboards are aimed directly at town favorite Chief Willoughby (Woody Harrelson) and his borderline-incompetent right-hand man with “vaguely racist leanings,” Officer Dixon (Sam Rockwell). But this tenacious, take-no-sh*t mother isn’t backing down, and after giving each of these guys an unfiltered tongue-lashing this game of mental chess is in full swing. 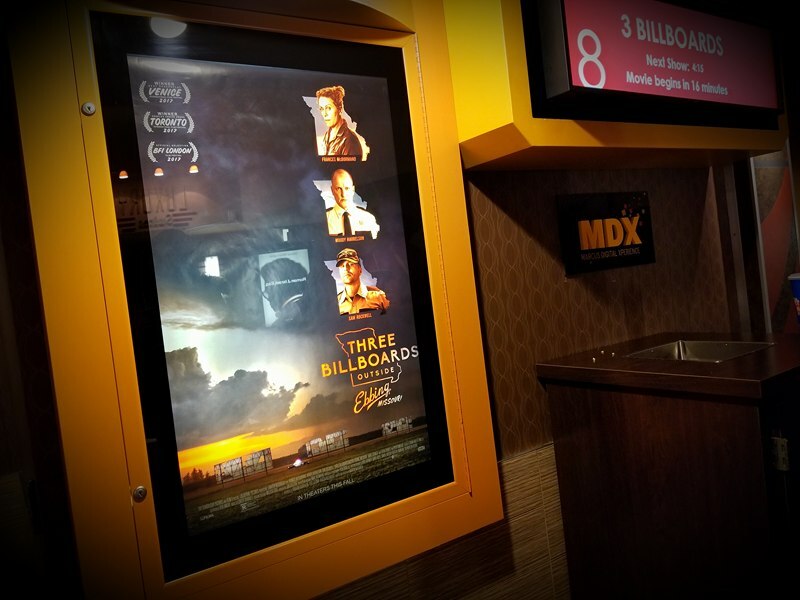 Normally a movie this arduous would leave audiences wanting to stick their collective heads in an oven, but what prevents “Three Billboards…” from being entirely bleak are the slivers of humor sprinkled throughout. And we’re talkin’ dry, low-key quips that strike a chord because of the stealthy wit and shrewdness behind them. God bless! It’s not much of a stretch, but I’m gonna g’head and say right now that McDormand will win a Best Actress Oscar for her role here. There are few in Hollywood who can do what she does so well – the seemingly effortless execution of a look that’s in one moment quiet and understanding before turning to hell fire and rage; her sharp tongue flinging words that she knows will sting because of the oppressive truth they represent. McDormand’s Mildred is so inherently strong in her pursuit of renegade, vigilante justice that for her to show any ounce of vulnerability doesn’t seem possible. And in the few instances in which she not only lets down her guard but completely crumbles, we totally grasp the substance of those scenes because we understand what it took for her to get there. A lot of the understated humor comes courtesy of the outstanding Sam Rockwell. As the bumbling and biased Dixon, he’s a living, breathing dichotomy. Consequences? Pfft, Dixon wears a badge; he doesn’t care. This character’s journey is a joy to witness, and Rockwell’s work here is Oscar-worthy for sure. I fully expect he will at least get a Supporting Actor nomination – and hopefully a statuette. Rounding out this talented ensemble is a collection of smaller-yet-crucial performances from Lucas Hedges, as Mildred’s “f*cking depressed enough” son Robbie; Central Minnesota native John Hawkes, as Mildred’s ex-husband Charlie; Samara Weaving as Charlie’s doe-eyed and blissfully clueless young girlfriend Penelope; Abbie Cornish as Chief Willoughby’s wife Anne; and Peter Dinklage as James, the “town midget” with a heart of gold. These characters are memorable and all so unique. They take huge risks with both their words and their actions, and they’ll worry about with the (extreme) ripple effect later. Maybe. “Three Billboards…” is brutal; it’s gritty; it’s downright depressing. But it’s also honest. There’s no coddling here. This is a tough movie to watch for sure, but that’s what makes it so amazing – and so worthwhile. Great description and review! I’m looking for Dormand to win over the mindless fake bodies who can’t even speak pap fluently! Just a great review! Saw it this weekend and enjoyed it. I agree about Rockwells performance and definitely McDormands as well. Quite the quirky movie to say the least.